The coming years will see a huge growth in augmented reality (AR) applications. Despite the fact that people and businesses have been fascinated by the idea of virtual reality (VR) for many years, they are now starting to realise that AR offers more practical applications for customer experience, so it should be no surprise that the market size for AR is forecast to reach $108 billion by 2021. The real breakthrough in the market may take a little while because of the current technical complexity of AR and the need for faster processors to allow AR to work optimally, but we are already seeing a number of fun AR applications in commercial use. IKEA has an AR app that allows you to see how the furniture you are planning to buy will look in your house, using the screen of your smartphone. And the New York metro has an AR application that helps you find the nearest station, again via the screen of your phone. Today, the smartphone is the most important distribution channel for AR. AR uses the camera and the screen of your smartphone to operate its applications. But an increasing number of observers already believe that the breakthrough of AR will eventually lead to the disappearance of the smartphone. They claim that within the next five to ten years a completely new set of interfaces will be developed specifically based on the many possibilities offered by AR. At the present time, Microsoft Hololens and Meta Vision glasses are the two most well-known examples of augmented reality hardware solutions. Both systems make use of a large pair of goggles or spectacles to observe the digital layer superimposed on reality. This kind of technology is mainly used in B2B applications, but there are also a number of potential uses in the medical world. For example, the Hololens is used during complex operations to give the surgeon additional information about the patient. Another important but very different market is gaming. How cool is it to blow away your enemies while you are using a pair of AR glasses! It really looks as though the bad guys are everywhere in your home, sometimes quite literally coming out of the walls and ceilings to attack you. The intensity of these games cannot be compared with the games you play on a 2D screen. The AR vision of Meta goes a very long way. As humans, we have two eyes, through which we see everything in three dimensions. But when we look at a screen, we only see things in two dimensions. In other words, we are under-using the full potential of our eyes. Meta therefore wants to create a world without screens, a world full of holograms. Imagine that your favourite football team is playing away from home in the Champions League. Wouldn’t it be great if fans, instead of travelling abroad, could go to their home stadium and watch the same game being played by live hologram projections? It could also raise extra revenue for the club. Win-win. Or what about an AR home shopping experience? Instead of popping down to your local branch of H&M, their range of clothes could be projected into your living room. Look down and you will see your new shoes on your feet. Look at your arm and you will see the wrist watch you have always wanted. The possibilities in a world without screens are truly limitless. The added value of automation for customers is obvious. Automation provides faster, more personal and more user-friendly transactions. To see the added value of augmented reality at this stage requires a little more creative imagination. Above all, it will change the customer experience in the online world, by making it more personal and more digital. Just imagine what the advertisements of the future will be like. Once we all view the world from an AR perspective, advertising will be different and personalised for each of us. In much the same way that advertising can now be personalised in the online world, AR will be able to personalise it in the offline world. Billboards will become blank spaces, onto which different images are projected for different people, depending on your personal AR interface. Advertising games can also be given a new dimension, by leaving digital objects in the real world. For example, the first person to find the hidden digital ‘treasure’ gets a big reduction on their next purchase of product X, Y or Z. And instead of hunting Pokémon, consumers can hunt for discount vouchers and other benefits. The offline retail experience will also become more digital. For example, an AR app could show the locations of all your favourite shops and brands within a shopping centre. You quite like a particular blouse but wonder what it would look like in a different colour and size? AR can show you that as well, and it can also tell you if it is still available or where it can be ordered. In an amusement park, AR could guide you to all the best attractions, as well as giving details of the current waiting times. In a different field, augmented reality will scale up the knowledge of experts. If a company only has one technical expert who needs to physically travel to different locations to inspect and solve complex customer problems, this is clearly a limitation in term of scale. In The Day After Tomorrow, I posit that this expert will stay at the company headquarters (or perhaps even at home). From there, he will be able to use AR applications to view the problems at a distance and give advice to his less technically skilled colleagues who are actually on site. In the past, it may have been possible for the expert to visit 10 customers a day, with most of his time wasted on travelling. Using AR and the help of less expert technicians, his specialist knowledge can now be made available to 100 customers a day. In other words, his impact is increased by a factor of ten! The waiting time for customers is reduced and the costs for the company fall. These are just a few of the examples of how augmented reality can have a beneficial effect on your customer relations. What’s more, it must be remembered that these examples are based on our current – and very limited – knowledge of AR. As this knowledge increases in the years ahead, new applications will be developed that for now we can only dream of. But 10 years ago, this was equally true for the mobile revolution. Which of us could ever have imagined the huge impact that smartphones and apps would have on our daily lives? And just as we now find it impossible to imagine how we ever lived without this technology, in ten years’ time, we will wonder how we ever managed to get by in the world before AR. Written by Prof. Steven van Belleghem, an expert in customer focus in the digital world. He is an award-winning author, and his new book Customers The Day After Tomorrow is out now. 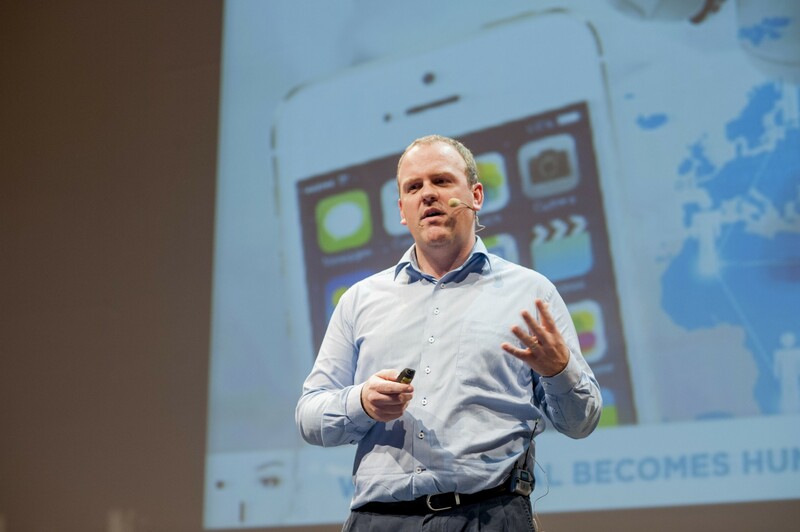 Follow him on Twitter @StevenVBe, subscribe to his videos at www.youtube.com/stevenvanbelleghem or visit www.stevenvanbelleghem.com.